Doors stick for a variety of reasons, and it can happen in old and new homes, on interior and exterior doors. Most of the time, it’s a small issue that only requires a little bit of your time to fix. But sometimes, a sticking door can indicate a deeper issue in your home. 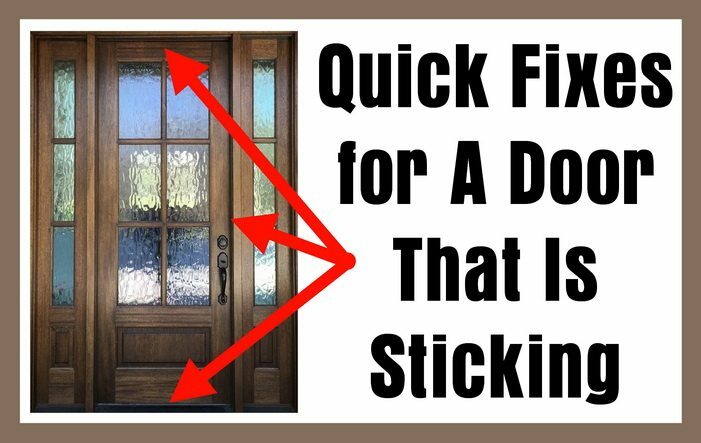 To help you determine how to fix that annoying door, you have to understand what causes them to stick in the first place. So here is a list of common causes of this issue and the easiest DIY methods to resolve the issue. If you hear a distinct unsticking noise when you open or close a door, without any excess drag on the door, it could be paint causing your door to stick. If your door was painted one, two, maybe even three times in the past without being sanded down to make room for the paint, this could be the cause of your problem. The solution? Sand down both the door and the jamb and repaint. Make sure you allow plenty of time for the paint to dry and cure, or you may repeat the issue. A door that has been improperly measured and cut could cause excess friction against the frame or the floor, which can lead to it “sticking” and make it difficult to open and close. Be sure to check for scraping on all sides of your door, and measure the door and the frame to ensure the fit is exact. If the door is too large for the frame on even one side, consider cutting down the door or replacing it completely. By cutting it down and ensuring the measurements are exact, you’ll eliminate the sticking issue and reduce wear and tear on the door over time. If you live in a humid region or if your doors always seem to stick after it rains, humidity and moisture could be your problem. In humid areas and after rain there is a lot of extra moisture in the air, which gets soaked into the wood of your doors, causing them to expand slightly. If it only happens after it rains, it’s probably not worth fixing, unless you want to trim down or replace every door. But if it’s a regular problem, consider making/buying slightly smaller doors to eliminate the sticking issue. Over time, gravity can make doors sag and cause the bottom corner to scrape the ground or rub against the door frame, especially if the door is made of exceptionally heavy wood. Or, if you have kids, they might be hanging on the doors, speeding up the sagging on your doors. To fix this, check the alignment of your hinges, and check the screws to be sure they’re properly tightened. Loose screws and misaligned hinges contribute to door sagging, which in turn contributes to doors sticking. If the issue continues, consider replacing your hinges completely, especially if they’re more than ten years old. If you have tried all of these simple fixes and your problem persists, it might indicate a deeper issue with the house. If windows stick or seem misaligned in their frames, and your floor is uneven in some sections, this could indicate a weak or damaged foundation. Consider having your foundation inspected for cracking, water damage, and other damage, as a crumbling or weak foundation can be dangerous. Unfortunately, foundation repair can be expensive. But when it comes to your safety, the cost is worth it. And, if properly repaired, your sticking doors may cease being an issue. Talk to a repair contractor or foundation inspector as soon as possible to evaluate the condition of your foundation and discuss repair options.